You could win one of three lovely signed prints. 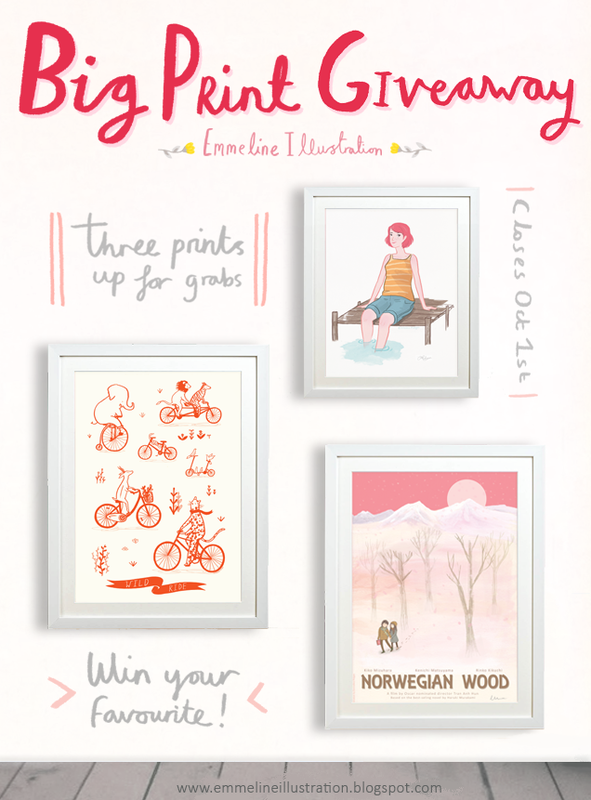 It's an easy one, just comment on this post with which print you'd like to win (Wild Ride, Norwegian Wood or Summer Dip) before October 1st and spread the word! All prints are signed and on 200gsm+ slightly textured paper. Wild Ride and Norwegian Wood are A3 size, whilst Summer Dip is just-right at A5. Wild Ride is a limited edition original screenprint. Open worldwide. Three winners will be randomly selected and announced in the afternoon of October 1st. There will be three separate draws - one for each of the prints, with one winner per draw - you enter a draw via your favourite print comment. One entry per person. If you can, please include your name and Twitter/Facebook handles in your comment. Find out more about the prints in the shop at www.emmelineillustration.mysupadupa.com. Tell your buddies! I would LOVE to win the Wild Ride print, the little elephant is too cute :) Such gorgeous illustrations. I would def love the "Wild Ride" one, it's so pretty!!! I love the Norwegian Wood one!! Wild ride is definitely my favorite, so much fun. I love Wild Ride! - I've always wanted to give a lion a backie! Norwegian Wood is so sweet. They are all great though! Thanks for the chance to win. eek they are all so nice! But, I think Wild Ride is my favourite due to the humour of it! :-) I'd love to win it! Definitely Norwegian Wood, my favourite Murakami novel! O I LOVE to have one of those! They're equally fantastic! Hey Iris, can you let me know which print you'd like to be in the draw for? Summer Dip (the pink haired lady), Wild Ride (the animals) or Norwegian Wood (the pink poster). Thanks! Wild Ride is my fav! Love them. All are beautiful, but it's a Wild Ride for me please. Hello! I would love to win any of these prints but my favorite is wild ride! I'm a fan of Wild Ride!! I would love to win Wild Ride!!! I love the Summer Dip print - its so calm and summery! I would love to win Wild Ride for my daughter's room - she's 2 and would LOVE this! The Norwegian Wood one is the best for me, as I love both the Murakami's book and the Beatles' song, so I'd love to win this one in particular. Anyway they're all beautiful! Summer Dip has the best expression! I'll put in my hopes for that one. Great job -- your style inspires me! I adore your Norwegian Wood print! Thank you for hosting this amazing giveaway. I love your work! Summer dip is my favourite! Great to meet you last night! I would LOVE Norwegian Wood - beautiful film, novel and print! Wild Ride would look wonderful in our living room! All are so adorable though. Difficult decisions but I love love love the Norwegian Wood print. Just moved into a new bedroom and my walls are a little bit bare at the moment! It's a really tough call between Wild Ride and Norwegian Wood - the other one's gorgeous too! Oooooooh, if I had to choose .... it would be ..... ooooooh ....I don't know ..... Wild Ride! Oh wow! I need some Wild Ride in my life !!! I really like the Norwegian wood one!